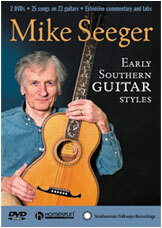 Mike teaches 25 songs and tunes, in a survey of traditional guitar styles from the rural South based on his Smithsonian Folkways CD (see above). Included are banjo-like styles, rags, blues, parlor guitar-based pieces, slide guitar tunes, and many song accompaniment styles, most of which Mike picked up directly from traditional players or their recordings - Maybelle Carter, John Hurt, Leadbelly, Sam McGee, Roscoe Holcomb, John Jackson, and Elizabeth Cotten, among others. Each piece is played through, followed by comments on style and a slow split-screen repetition.